With more devices come varying screen resolutions, definitions and orientations. New devices with new screen sizes are being developed every day, and each of these devices may be able to handle variations in size, functionality and even color. Some are in landscape, others in portrait, still others even completely square. As we know from the rising popularity of the Android, iPhone, iPad, tablets and advanced smartphones, many new devices are able to switch from portrait to landscape at the user’s whim. 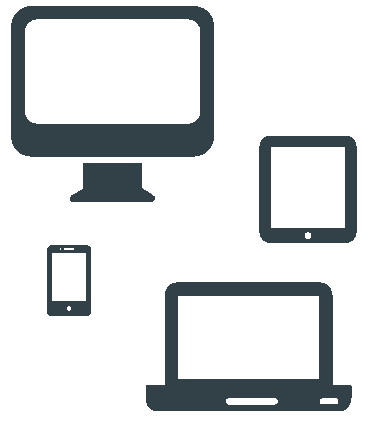 With responsive design, you can create a website that will fit all of those screens without compromising your site design. Over the last 5 years, there has been an increase in phone and tablet use. The most recent study shows that mobile and tablet are over 70% of a website's audience. The desktop still has a large percentage of your visitors, but is decreasing rapidly. You wouldn't want to miss out on any possible clients, that is why we create our sites to look great on all possible devices. vinSITE solutions has been developing websites since 1996. We only use the latest and best technologies to ensure a great impression.